Turntables come in many flavors. One of the main decisions to make when buying one is choosing between a direct drive and a belt driven mechanism. What are the differences between them? Which are the pros and cons? The belt will eventually wear & need to be replaced. Belt drive turntables tend to be primarily used by audiophiles. Because there is no physical connection between platter & motor, it is possible to stop or even reverse the platter by hand. The motor itself generates unwanted vibration which can affect the sound. This can partly be addressed by shock-absorber systems between platter & motor. Direct drive systems are exclusively preferred by DJs, for the fast start-up at cue, vari-speed controls for beat-matching & the ability to manipulate the platter by hand without causing damage; for scratching, etc. Simplified description of 'standard' vs direct drive motor. 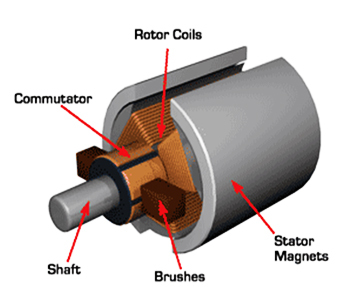 In a standard electric motor configuration, permanent magnets are held in a fixed position surrounding a wire coil on a central spindle which is free to rotate. The rotating spindle extends outside the enclosing magnets & is then available to do the 'work' of turning an attached device - in a turntable, this would be a rubber pulley belt connected to the platter. Stopping this with your hand would lead to the belt slipping, detaching or breaking. In a direct drive motor, this relationship is reversed. The coil is held stationary, fixed to the body of the player. The magnets are attached to the underside of the platter itself. The spindle of the platter is the spindle of the motor. As the two are not physically connected, stopping the platter with your hand causes no issues. There is the possibility it could overheat if held long enough, but presumably direct drive turntables, especially those intended for DJ use are designed with sufficient cooling as to make this improbable. The turntable quality factor primarily affected by the drive method is speed accuracy and stability. Between direct drive and belt driven types, direct drive is more accurate. In the direct drive system, the motor is a multiple pole motor, and the magnets are part of the turntable itself. This allows accurate speed control (by a PWM drive system). The turntable platter is the only moving part, and because it acts as part of the drive motor is generally heavier and more stable that that used on other turntables. In the belt driven system, the motor is usually a simple DC motor. The belt is between the motor and the turntable. Speed accuracy and control can only be as good as the motor used. This can vary a lot. The belt is subject to many problems, such as stretching, slipping, and moving out of position. So speed variation and vibration can be transferred to the turntable. So from a quality standpoint, the direct drive system is better. But due to the additional electronic components and design costs, these are more expensive. Conversely, the advantage of the belt drive system is its lower cost. The disadvantage is that the turntable stability and therefore the audio quality are worse compared to the direct drive system. Of course, there can be varying quality and cost within each type, both related to these components and others on the turntable. Any turntable purporting to be high-quality system should have a strobe along the outer rim of the platter. This is the best tool to critique the accuracy of the turntable speed.